Not to be confused with Syria. For the mukim, see Seria, Belait. 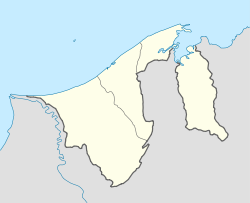 Seria is a coastal town on the north-east coast of the island of Borneo, in the Bruneian district of Belait. Officially known in Malay as Pekan Seria (literally 'Seria Town'), it is governed as a municipality (Malay: bandaran), as well as two village-level subdivisions under the mukim of the same name. Seria was the original place where oil was found in Brunei, and has since become a centre for oil and gas industry, the primary industry of the country. The postcodes of Seria include KB1133 and KB4733. According to the Historical Dictionary of Brunei Darussalam, the name 'Seria' was given by the British authorities, an acronym for the South East Reserved Industrial Area. The Industrial Area is located near the place where oil was first discovered in the area in 1929. The first commercial oil well  was spudded in 1929 in Padang Berawa on the west bank of the Seria river (Sungai Seria). Seria area was gazetted as a municipal area in 1936. The town came under the authority of the Kuala Belait Sanitary Board which also had responsibility for the municipal area of Kuala Belait. The first landing of the Japanese invasion force during World War II in Borneo was at Seria where the Left Flank of the Kawaguchi Detachment came ashore about 04:40 on 16 December 1941, nine days after Pearl Harbor. They were faced with a scene of devastation of the oilfields due to "Operation Denial" carried out by employees of the British Malayan Petroleum Company (now Brunei Shell Petroleum) and the 2nd Battalion, 15th Punjab Regiment, and British Army Royal Engineers. The invasion force continued oil drilling units and restoration of the oilfields began immediately under Sato, Chief Engineer. Over the next three years, the Japanese restored production to nearly pre-war levels, the activity being hectic as other sources of supply to the Japanese war machine were closed off, so much so that most of the oil fueling the Japanese in the last six months of the war came from Seria. Operation "Ha-Go 2", the Japanese denial exercise commenced on 10 June 1945, the day of the Australian liberation forces landing at Muara. The fires could be seen 100 km out to sea. When the Australian 9th Division as part of Operation Oboe Six eventually entered Seria on 29 June 1945, the situation was chaotic, with 38 oil well fires, demolished buildings and wrecked installations. By 17 August 1945, when American fire fighting teams (Patton and son) arrived, 26 of the fires had been put out by oilfield staff assisted by a detachment of the Australian Royal Engineers. By November, production was restored, albeit stored in temporary tanks, and oil export to Lutong recommenced on 11 December 1945. Seria was also one of the centres of a small rebellion against the monarchy on 8 December 1962, which was suppressed by the British Army. This event became known as the Brunei Revolt. Under the rule of His Majesty the late Sultan Omar Ali Saifuddin, the town blossomed as commercial buildings such as the current shophouses along Jalan Sultan Omar Ali. The suburbs of Panaga are located to the west of the town while Kampong Baru is located to the east of the town. The administrative capital of the Belait district, Kuala Belait is located about 10 miles (16 kilometers) to the west and is linked to Seria by both road. Mukim Labi, also in the Belait district is located to the east of Seria and the national capital of Bandar Seri Begawan is about 100 km to the north-east. Unlike the other municipal areas in the country, Pekan Seria is not divided into Kampung. However the neighboring kampung serve as suburbs to Seria. Jalan Utara. This is home to a large number of expatriates due to a large concentration of Brunei Shell housing and facilities located in the area. The head offices of Brunei Shell Petroleum is found in this area as well as the well-known clubs Panaga Club and BSRC. The Canadian Houses area along Jalan Tengah. This area consist of Shell housing facilities built in the style of Canadian log houses. The timber used to construct these houses were imported from Canada. The area around the Panaga Police Station and Sekolah Rendah Panaga (Panaga Primary School). This area is predominately Malay and more commonly associated with the term "Kampung Panaga". The military area immediately to the west of the town area. North and West of Seria. These are the areas between Panaga proper and the municipality of Seria. It contains a number of British Army and Brunei Shell facilities and housing for both the British Army and Brunei Shell employees. Kampung Baru is located to the east of Seria on the left banks of Sungai Bera. This is a mainly Chinese and Iban area. The old wooden railway, built by the Japanese to Badas, runs through Kampung Baru. Kampung Lorong Tiga Selatan is a new village constructed by the government as part of the Landless housing scheme. It is located south of the Seria municipal area towards the Seria Bypass. Sungai Bera is an industrial area to the north of Kampong Baru and the north-east of Seria municipal area. It contains the only oil refinery in Brunei. Kampung Jabang is also known as Kampong Setinggan and is located immediately to the south of the municipal area. Anduki is a sparsely populated area between Seria and Lumut. It contains the Anduki airfield and the Anduki recreation area. Seria is the heart of the oil industry in Brunei, and also the site of the first commercial onshore oilfield discovered in Brunei. The town sits atop the Seria Field, which was discovered in 1929 and has been continuously in production since then with the exception of short periods after the Japanese invasion and Allied liberation of Brunei in the Second World War. There are numerous nodding donkeys in and around the town and this has become the unofficial symbol of the town. Reports circulate of a major oil well blowout in 1953, which resulted in well liquids flowing out of fissures in the ground. (Cited in Tingay 'et al. ', "Present-day Stress orientation in Brunei...", Jnl.Geol.Soc.Lond. vol. 162 pp39–49, 2005) This has led to inevitable comparisons with the LUSI mud volcano in Java, which has been flowing from 2006 to the time of writing. The Brunei Shell Petroleum (BSP) Company Limited is headquartered in Panaga and has various facilities related to the oil and gas industry in Seria. The Seria Refinery is the only refinery in Brunei and is located in the Sungai Bera area together with the Seria Crude Oil Terminal(SCOT), the New Gas Compression Plant(NGCP) and the New Industrial Area(NIA). The open-air oil water treatment facility at the Sungai Bera Holding Basin has since been discontinued due to environmental reasons. The Billionth Barrel Monument - commemorating the billionth barrel of crude oil produced from the Seria Field. The roundabout at the intersection of Jalan Maulana and Jalan Tengah. The roundabout at the intersection of Jalan Maulana and Jalan Utara. A statue representing Freedom is located at the centre of this roundabout. The Sungei Seria estuary is one of the finest areas in Brunei for observing migrating birds. Public recreational activities in Seria are mostly limited to the country clubs (Panaga Club and the Brunei Shell Recreation Club). There is an 18-hole golf course in Panaga Club and an Equestrian area in the Brunei Shell Recreation Club. The British Army maintains its own recreational activities within the British Garrison. This area is not open to the public. Fishing and windsurfing is carried out at Jubilee Recreation Park (Taman Rekreasi Jubli in Malay) in Anduki. It was opened by His Majesty, the Sultan and Yang Di-Pertuan of Negara Brunei Darussalam, in 1992, a contribution from Brunei Shell Petroleum to commemorate the Silver Jubilee of the Sultan to the throne of Brunei. Craig Adams of the NHL's Pittsburgh Penguins was born in Seria, though raised in Calgary, Alberta. Adams won a Stanley Cup with the Carolina Hurricanes in 2006, and with the Pittsburgh Penguins in 2009. Electricity used to be locally generated with a natural gas fired power plant. This has since been demolished and replaced with a solar plant, with a generation capacity of 1.344 MWh. Local demand is higher than the generation capacity and electricity from the Lumut Power Plant is sent to Seria. The solar installation is the only functioning clean energy source in Brunei to date (November 2013). Most of the roads within the municipality are surfaced. However, not all the roads are level to encourage effective drainage during a downpour. The main commercial street in the municipality is Jalan Sultan Omar Ali and shops and other commercial buildings can also be found in the vicinity. Seria is connected by roads west through Panaga towards Mumong and Kuala Belait, east through Sungai Bera and Anduki to Lumut, Labi and Bandar Seri Begawan and south besides the Housing Scheme area towards the Seria Bypass. The main highway from the Malaysian border west of Kuala Belait to Muara Town passes south of the municipality. This section is known as the Seria Bypass. a regular shuttle towards Kuala Belait (B$1-one way) - thrice hourly except lunch and at night. There are three routes, Laluan 1, Laluan 2 and Laluan Keliling Kuala Belait. There are no working railways or light rail in Seria. The route and remnants of a wooden railway from Seria to Badas that was built by the British Malayan Oil Company (now Brunei Shell Petroleum) before the war to service the water supply to Seria from the Badas pumping station on the Sungai Belait are still visible. BMP staff hid essential components of the railway from the Japanese during World War II who therefore were unable to restore it so it fell into disrepair. When the liberation forces of the Australian 9th Division arrived, these components miraculously re-appeared and the railway was quickly restored to action to carry two 25 pounder guns and ammunition to Badas, to harry a Japanese contingent that was still in the area. George William Percival Clark ran the pump station before, during and after the war. He was also president of the Shell Recreation Club in Seria in 1951. Two of his daughters, Patsy and Gracie, were drowned in the Badas river in 1951 as a result of a boating accident. There are no ferry services, river services or port services in Seria. The nearest port is in Kuala Belait, and the nearest deepwater port in Brunei is Muara Port. There are no airports in Seria. However, there is an airfield in Anduki that caters mainly for flights to offshore Brunei Shell Facilities. Commercial travellers would have to travel to either Bandar Seri Begawan or Miri to catch a commercial flight. There are also a number of helipads around Seria town, including one at Panaga Health Centre and at the Brunei Shell Petroleum Headquarters. St. Michael's Mission School was the first English school in the country. It was a Private Catholic All-Boys School. Due to declining numbers, it was closed down in late 2006 and its student body was merged with the formerly all-girls catholic school St Angela's. The Anduki area also houses the AnNaem Islamic cemetery site. The An-Naem Islamic cemetery site occupies an estimated 8 acres (32,000 m2) and has 25 blocks. Opened in 1993, four blocks with 220 burial plots have been occupied. Craig Adams, National Hockey League player for the Pittsburgh Penguins. He was born in Seria and raised in Calgary, Alberta, Canada. The former Malaysian Minister of Agriculture and Education, Tan Sri Datuk Amar Dr Haji Sulaiman Haji Daud, who hailed from Sarawak, used to work as a dentist in the Government clinic in Seria, before entering the political scene in his own country. ^ "Belait District" (PDF). www.information.gov.bn. Retrieved 26 February 2018. ^ "Brunei in Brief" (PDF). www.information.gov.bn. Retrieved 26 February 2018. ^ "Brunei Postal Services - postcodes". post.gov.bn. Retrieved 26 February 2018. ^ "Seria Power Station gets solar panels". Brunei Times. Retrieved 16 November 2013. ^ "Weatherbase: Historical Weather for Seria, Brunei". Weatherbase. 2011. Retrieved on November 24, 2011.